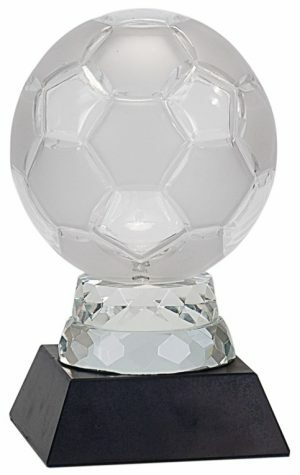 The incredible price of this crystal soccer trophy offers you a great option to purchase one for every member of your team without breaking the budget. Not to mention every member of that team would be thrilled to have their own personalized trophy. This award features a soccer ball on the top with a slender column that has a 3-D laser etched engraving of a soccer player on the inside. Item# CRY214 measures 8.75”x 2.5”. Hit Trophy’s skilled design team will laser engrave the base for free with up to 3 lines of any message to recognize a victorious season, champions, or team MVP’s. This item and all of our crystal products come packaged in a deluxe velour lined presentation box.